Nominated for the 2014 Robert Motherwell Book Award for outstanding and original thinking on the topic of Modernism in art. ​Written in common language for the student of art, "The Awakening Artist" examines the evolution of human consciousness as seen throughout the history of art. The book became one of the inspirations behind the Post Personalism movement. 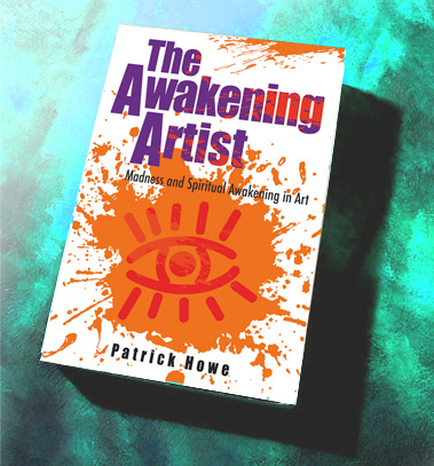 The Awakening Artist shows how human insanity and spiritual awakening have been entwined throughout the history of humankind. Additionally, the book discusses the spiritual philosophies of many of the great artists of the world. It also also draws insights from art historians Roger Lipsey and George Rowley, mythologist Joseph Campbell, psychologist Carl Jung, astrophysicists Carl Segan and Albert Einstein and other great thinkers who believed that it is imperative that humanity evolve beyond negativity and self-centricity in order to survive in what Mark Tobey called a "higher state of consciousness". "I can honestly say that The Awakening Artist has opened me to thinking about the spiritual component of my own work, and to seeing the work of others through the "awakened" lens. So much of what is written about in art history rehashes the same tired concepts, and says little or nothing about what the artist’s inner experience may have been. Patrick's thesis is based on his own observation and spiritual experience—and there is boldness in it". I´m from Montevideo, Uruguay and I’ve finished reading your book a few minutes ago . I had bought it in London and it kept waiting for me two years in my bookshelf. Now I see that I wouldn’t have grasped its inner depth if I had not gone through some revealing experiences during those years. So I came into it just on time. It touched me deeply and no doubt it will influence my creative process which I hope will soon turn into an awakening one. Thanks, thanks and thanks for that, Patrick.